The systematic slaying of thousands of elephants is a subject always likely to stir emotions. So it has been in South Africa, where the government has opened a public consultation on proposals to resume an elephant cull. 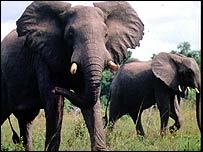 In the highly charged debate, opponents refer to the "murder" of elephants, while cull-supporters warn of a "holocaust" among other species if elephants go unchecked. South Africa's Sunday Independent has played host to the argument on its opinion and letters pages. "Letters from our readers have been overwhelmingly against culling. The idea appals them," says the paper's deputy editor Andrew Walker. The outcry now may be nothing compared to the response if and when TV images show rangers in helicopters herding elephants into small groups, downing them with tranquiliser and then finishing them off with a high-calibre shot to the head. The irony is that the explosion in animal numbers is due to the success of conservation projects, and measures to counter poaching and ivory-smuggling. In Kruger National Park, some 13,000 elephants now roam - nearly double the 7,000 that was considered the optimum number during South Africa's apartheid years, when culling took place regularly. The repopulation of elephants since culling was stopped in 1994 has been so dramatic that it threatens other species, and the elephants' own well-being. An animal with a large range, a long lifespan, a huge appetite and no predators is trampling less robust creatures underfoot. Elephants can turn woodland into grassland - killing off the majestic baobab trees that can be thousands of years old, and depriving birds like vultures, eagles and ground hornbills of places to nest. They have also been blamed for driving rhinos off their ranges, and threatening delicate botanical assets. "They are converter animals - habitat engineers - they will modify their habitat if allowed to do so," says Rob Little, director of conservation at World Wide Fund for Nature (WWF) South Africa. South Africa National Parks (Sanparks) has recommended a return to culling to save the country's flora and fauna before it is too late. "Culling should certainly be retained as an option," says WWF's Mr Little. The government insists it has not yet made its mind up, and is considering all options. "This is spoken about at a very emotive level - this government prefers not to decide what's best for its country on the basis of emotion," says JP Louw, director of communications at South Africa's environment ministry. Some groups, however, believe the deal is done and the 18-month consultation will be more about persuading domestic and international public opinion. The International Fund for Animal Welfare (Ifaw) insists there is no scientific proof that elephants threaten biodiversity and says there is no way they should be culled until there is concrete proof of the damage they cause. 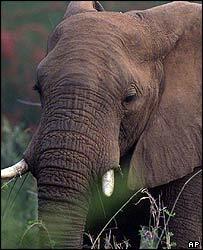 "Sanparks is looking at elephants in a vacuum. They need to adopt a far more holistic approach," Ifaw's South Africa director Jason Bell-Leask told the BBC News website. He advocates allowing greater migration of elephant groups between parks and countries in southern Africa. Others point to successful projects to transport elephants to less-populated areas, and to use contraceptives. A two-year experiment with contraception in South Africa's Greater Makalali game reserve used darts filled with a hormone that prevented any female elephants from giving birth. However, experts say a programme to immunise the 5,000 cow elephants in the Kruger, and to track them all for further booster shots, would be unfeasible both in terms of cost and logistics. Moreover, because elephants live long lives, it would have no immediate effect on their numbers, and the damage they wreak. "We're researching how contraception can be used as an effective method," says JP Louw. "At present we don't know anyone able to tell us that contraception works. "The option of translocation we continue to test. But this problem of overpopulation is a problem across southern Africa, not just South Africa - other countries have their own problems." 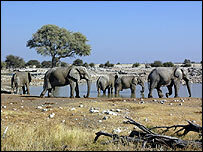 Botswana and Zambia have overpopulations of elephants and want to conduct culls that would allow them to sell the ivory. On Monday, Zimbabwe said 50 elephants had died "because of shortage of water and pasture" in a western reserve, and that it wanted to cull or move herds to Namibia. As the debate rages on, officials insist that doing nothing is not an option. "To say we should wait is to say 'wait until everything is destroyed'," South Africa's Mr Louw says. "That is definitely not responsible management."